So You Think You Can Mom? : Free Bowling For Kids All Summer! AMF Bowling Centers offer an amazing program for children ages 15 and under. 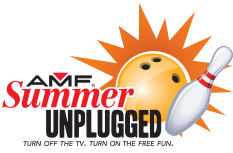 The Summer Unplugged program gives your little bowler the opportunity to bowl everyday of the Summer for FREE! Starting now and running until September 2nd, 2013, you can visit your local AMF lanes and let your kids bowl 2 FREE games per day. All you have to do is register your children here! No coupons or vouchers required! Just register online and take your confirmation page to your local AMF. A membership card will be assigned during your first visit and should be used to redeem your games on future visits. No worries if you forget your card, they will be able to look up your info and get you on the lanes quickly!